In 1982, the US Marine Corps’ (USMC) Program Office released a Request for Proposal (RFP) for the development, manufacture, installation, and testing of an electric drivetrain (an engine driving a dynamo with an electric motor providing the drive to the sprockets) in an M113 test vehicle. This was an interesting return to this type of drive technology which dated back to before WW1, but which had been abandoned by the US Army in 1975. After the issuance of the original RFP in 1982, several firms submitted proposals, but all of them were reliant upon advanced high-speed AC motors which were very expensive and, as a result, they were all rejected. A subsequent proposal was offered by the US Army Research, Development and Evaluation Center (known as ‘BRDEC’ with the ‘B’ standing for Belvoir as it was based at Fort Belvoir, Virginia), in conjunction with the Southwest Research Institute (SwRI), for a much cheaper DC drive system which would also be lighter, simpler, and cheaper. That vehicle was known as the M113 Electric Land Drive Demonstration Vehicle, although it did retain the same amphibious capability it had as an unmodified M113. The US Marine Corps (USMC) then embarked on their own program to convert an M113A2 to electric drive to improve its performance, more specifically, to make it faster and to add the possibility of a separate water drive propulsion system powered by an alternator. The choice of an M113A2 was not because the USMC was going to replace its LVTP-7 vehicles with the obsolete M113, but to use that platform merely as a proxy, a test-bed for the technology to investigate the possibility of incorporating it into a replacement for the LVTP-7. This work would continue through the 1990’s as part of a program for the development for the Advanced Amphibious Assault Vehicle (AAAV) for the USMC. The basic requirements that had to be obtained from this modified M113A2 were to keep the weight under 28,000lbs (12.7 tonnes) Gross Vehicle Weight (GVW), with speeds of 45mph (64.4 km/h) on land and 10 mph (16 km/h) in water. Just like the Fort Belvoir alternative for the Electric Land Drive Demonstrator Vehicle (ELDDV), the USMC selected a DC drive system for their project and, also just like the ELDDV, the USMC chose the 300 bhp Detroit Diesel 6V-53T engine. The ELDDV used Bendix generators and Mawdsley traction motors but the USMC project used a Westinghouse alternator connected to General Electric drive motors. The 430 lb (195 kg) Westinghouse 500kVA alternator was driven by means of a belt and replaced the original transmission for the M113 which had been removed. It was exactly the same type and arrangement as the one already demonstrated by Food Machinery Corporation (FMC) on their electric drive M113 (M113 Variable Frequency AC Electric Drive Test Bed) in 1969. It was recommended though, that, for future systems, two Bendix 28B329-1 brushless alternators should be used instead to save 280lbs (127 kg) from the weight of this part of the system and these are the type of alternators selected for the ELDDV. The initial approach for the design of this vehicle called for the use of three 40hp General Electric model 5BY401A5 motors on each side combined to form a single motor which would measure 26.4 inches long x 18.6 inches (671 mm x 472 mm) and weigh 574 lb (260 kg). This plan failed, however, as the model 401 motor was no longer in production and had been replaced by the 90hp model BT2378. This motor was more efficient and took up less space than the original 3-motor arrangement and the outputs of two motors could be cast in a single piece, saving weight as well. 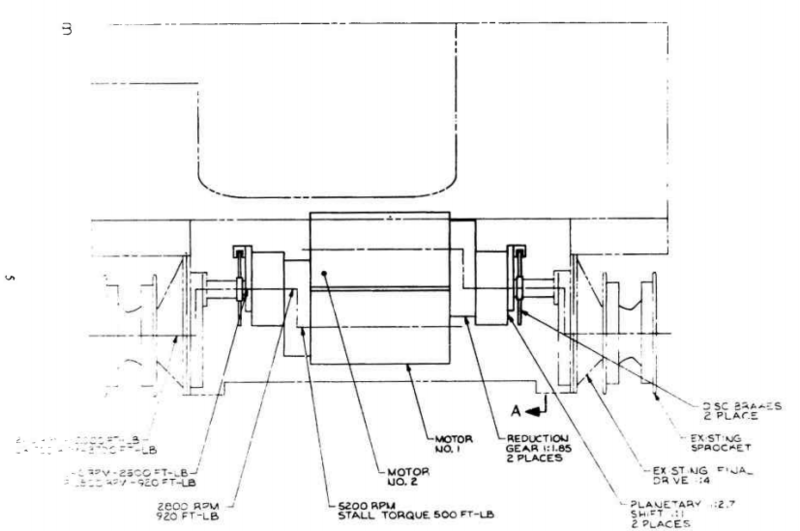 The total weight for this design of electric drive was therefore reduced to just 2,767 lbs (1,255 kg) and could be reduced yet further as a ‘lightweight’ option changing the oil cooled alternator and rectifier, bringing the weight down to 2,430 lbs (1,102 kg). With further development, the designers were confident further weight saving could be made from this too. The electric motors are, in turn, connected to a Funk two-speed gearbox coupled to each final drive although the drive was retained at the front. This made the system simple and effective and removed the need for moving the drive to the rear as done on the ELDDV with the consequent modifications that vehicle needed to the rear. US Marine Corps Electric Drive M113A2 illustrated by Andrei ‘Octo10’ Kirushkin and funded by our Patreon Campaign. The US Marine Corps project worked, it was relatively simple and did not require the modifications to the back that the Belvoir system did. 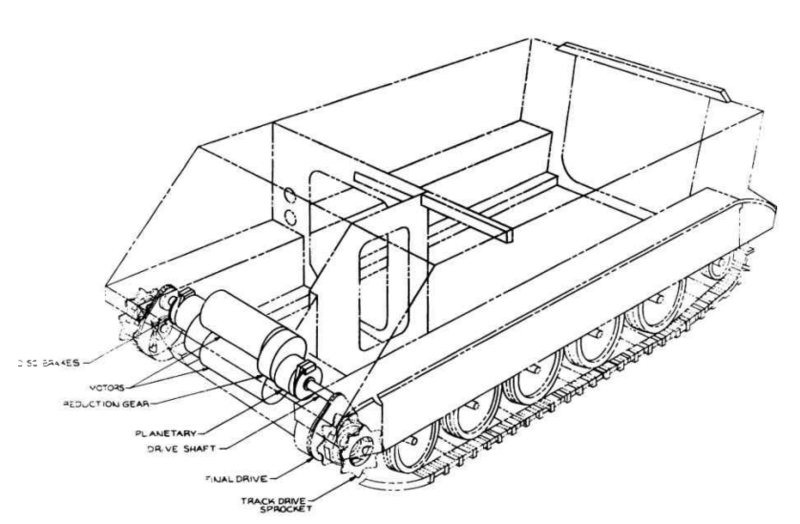 The vehicle yielded valuable information about the feasibility of installing electric drive in a light vehicle for Marine Corps use but subsequently, nothing further was done to pursue this idea with the M113. Instead, much of this work would be reborn in the project to find the new amphibious landing vehicle for the Marine Corps known as the Advanced Amphibious Vehicle (AAV) until it too was canceled. The status of the modified electric drive M113 from this early work though is not known. M113 Electric Land Drive Demonstration Project Volume 1: Vehicle systems Design and Integration. (1992). Thomas Childers, Gerald Sullivan, Cam-Nhung Coyne, Mark Matthews. US Army, Belvoir Research Development and Engineering Center, Virginia. Survey of Advanced Propulsion Systems for Surface Vehicle. (1975). Frederick Riddell. Institute for Defense Analysis.